The South Ferry subway station in Lower Manhattan. Photo by New York MTA, via their Flickr page. 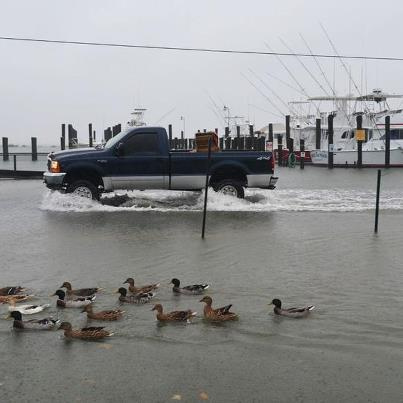 A truck navigates flooding in the Wachapreague Marina in Virginia. Photo by Betty Flowers/NASA via Flickr creative commons. LaGuardia Airport during Hurricane Sandy. Photo by Port Authority of New York and New Jersey, via their Twitter feed. It spans 468 stations and over 600 miles of track, pulsing through four of New York City’s five boroughs as the great uniter of the area. Everyone pays the same fare. Everyone has a preferred line. Everyone curses its fussy weekend service. And almost everyone uses the subway. Until it goes dark. On Tuesday, as officials discovered the breadth of tunnel flooding from an enormous hurricane, New Yorkers were warned that the bulk of the muscular subway network could be lost for “a good four or five days,” Mayor Michael R. Bloomberg said. As the remnants of Hurricane Sandy left the city on Tuesday, transit officials surveyed the damage to the system, which they shut down on Sunday night as a precaution. What they found was an unprecedented assault: flooded tunnels, battered stations and switches and signals likely damaged. With the subway and regional commuter rail still shut down, many people returned to work in Manhattan today and traffic was predictably lousy, as the Times reports. As bad as it for the New York system, it might have been worse for New Jersey Transit, which operates light rail, subway and commuter rail — all of which remain suspended. The Wall Street Journal reports that each of New Jersey Transit’s 11 commuter rail lines suffered serious damage, in addition to flooding that has crippled the underground PATH trains that connect New Jersey to Manhattan. Transit systems in Baltimore, Philadelphia and Washington D.C. are back in service, albeit with some lingering effects from Hurricane Sandy. 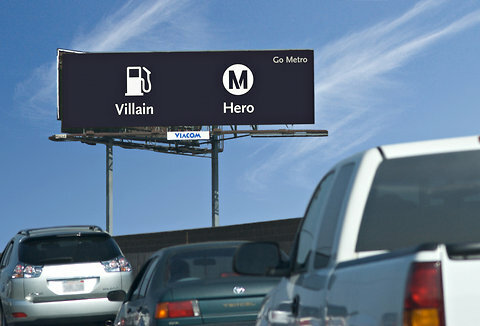 A nice mini-profile of Michael Lejeune, Metro’s first creative director who pushed for more striking marketing efforts to help brand Metro and raise awareness that Los Angeles County actually has a large transit system. The marketing is credited with boosting discretionary ridership. I’m a big fan of the signs but also take note of what readers tell me all the time: slogans are good but great service is even better. The Claremont City Council says they’re upset that Measure J won’t fund an extension of the Gold Line from Azusa to Claremont and beyond. As we discussed over the summer here, Measure J would only provide funds to accelerate Measure R transit projects — not extend any of them past their current end points. The editorial endorses J, saying it would provide more mobility and more jobs. The editorial also examines the national security angle and the relationship between oil, the Middle East and Israel. The op-ed is by the Bus Riders Union’s Eric Mann and Sunyoung Yang; the headline is also the the first line of the op-ed piece, which sets the tone for the many allegations that follow. The editorial backs Measure J because of the need for more jobs and transit improvements that would benefit all riders. However, the editorial has reservations about Metro’s ability to control costs and says that bus system needs more investment. The Chamber says that Measure J would help build transit projects and create jobs. For those keeping score at home, the Beverly Hills Unified School District Board voted to oppose J, the Beverly Hills City Council went neutral and the Chamber is for it. The city and the school district are suing Metro over plans to place tunnels for the Westside Subway Extension under part of the Beverly Hills High School campus. I know many people who have reservations about Measure J, especially when we also have the state’s Prop 30 on the ballot. People really do not want increase in taxes in tough times. If it’s picking one or the other and the choice is funding for our schools and education over public transit, there’s no comparison: education is more important. Prop 30 helps our schools statewide so I can see that passing (or maybe not), but Measure J only benefits a few. Education helps our children to succeed in the future and make our economy stronger, Measure J doesn’t. People in SFV will still not have a rail line, people in Claremont still won’t get the Gold Line extended, and everyone in LA still pays $1.50 per ride whether it’s a short ride from Little Tokyo to Union Station or a long ride from Aviation all the way to Norwalk. We still would have unfairness in the system where a rider who only travels 5 miles on bus or light rail that involves a transfer paying $3.00 where another that travels over 15 miles get by with $1.50 on one bus or light rail line. People will still pay $75 a month or $900 a year for a monthly pass without regards to how they actually use it on a daily basis. It’s basically taxing ourselves to benefit a few with no real change for everyone else. Measure J does not raise taxes at present. It does continue the Measure R half-cent sales tax after it expires June 30, 2039. It’s more accurate to say it’s a tax increase in mid-2039; Measure J won’t impact the amount of sales tax you are presently paying. Measure R isn’t just for transit, it also pays for highway and bike/pedestrian improvements. I think a “A voter in LA” is a cover for some other commenter by the name of Steve or something who kept going on about the revolutionary effects of everyone switching to scooters. Look I don’t know where you (or the two of you if you are different people) come up with this idea that transit dependent Angelenos (or Angelenos in general) will switch to mopeds/scooters and motorcycles. I’ve lived in LA for almost twenty years now and I see no increase in the number of any of those vehicles. And for the past twenty years gas prices have only risen and the population just keeps increasing. My main streets and freeways are Lincoln, PCH, Sepulveda, Wilshire, Sunset, the 105, the 110, and the 405. I’ve driven these roads for all those twenty years and have not noticed a significant or even barely recognizable jump in the amount of mopeds/scooters or motorcycles. You guys are living in some kind of dream world. Most Angelenos including myself and transit dependents our commuters and will stay that way for decades to come. We will commute either by public transit or personal automobile (the vast majority of us will do the latter) not some two wheeled vehicle. IT MUST BE PASS, there is no other alternative. If we have good PUBLIC transportation it improves the quality of life. Where perhaps Parents can get to there kids and check up on there home work or make sure there kids are not in the streets, also for students who can zoom around on a rail or bus to school can increase there quality way of life instead of spending time looking for a parking spot. at the end of the day it saves the parents , the students money in not having to drive around in a car or even having to buy one. There’s no denying that sales of motorcycles and scooters are going up in correlation to gas prices these days. You cannot deny that fact. It doesn’t take much to Google “motorcycle scooter sales increase” and you see this happening all over the US, not just in LA. “How to get around LA” is not a A) the car or B) Metro choice selection. There are multiple choices in this question and everyone has a different answer which best suits their needs. And face it, public transit is not for everybody. There are many places in LA where services are limited and even non-existent. If it’s between waiting for a bus that comes only once an hour or taking 20 minutes to walk to the nearest bus station, just to travel a 5-10 mile distance (and cost $3.00 one-way if there’s a transfer involved), it’s still faster and cheaper to just get going on a bicycle, moped, scooter, motorcycle, hybrid or an all-electric vehicle. I sent in my mail in ballot and voted no on Measure J. It does nothing for where I live so why should I pay taxes on it? Metro has other alternatives they have not yet looked at. They need to realize that they can’t keep coming back to taxpayers to solve their problems over and over again. If the current managers and politicians can’t figure it out, it’s time to change the people who run things at Metro. Measure J might not get a rail line to every city in the county, but it does provide for transportation, bike, and pedestrian improvements as each city sees fit. Much of what we’ve seen in LA City’s plans for bike/ped improvements have been thanks to its local-return portion of Measure R.
I think the real reason people in the Pomona Valley are upset is the apparent bait-and-switch they’re seeing in Measure J. Measure R included language describing the Gold Line Foothill Extension as a project extending from Sierra Madre Villa to a terminus in Claremont. Only half of that was funded. Now, by excluding the second half of the project Metro is going even further back on its word. This betrayal is made worse by the huge support businesses, students, residents, and local politicians have given the project – many of these towns have finished station area plans in anticipation of the line and plenty are already in the process of actual development. To see such a supported, shovel-ready project cast aside in favor of more politically advantageous projects elsewhere in the county is disheartening to say the least.